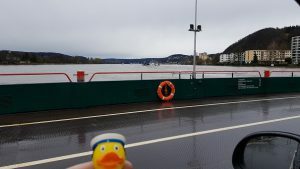 As the flock loves to sail, also on ferry boats, and as we spontaneously decided to visit castle Eltz on the other side of the Rhine River, we took the ferry boat at Bad Honnef and a short but nice and cheap adventurous trip across the river. Big load boats with coal were crossing our way and deck man Heinje and rescue swimmer David were in charge to support the crew navigating. 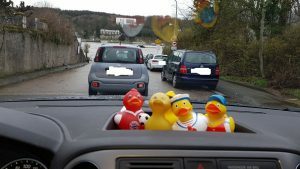 The adventure costed 2.50 Euro, a bargain for all the fun we had. 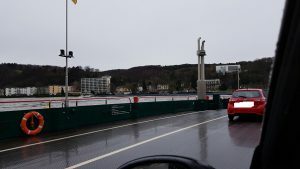 We also crossed the state line of Rheinland-Pallatinate and North Rhine-Westphalia.